When it comes to pubs, London can’t be beaten. But we’ve got a bit of competition from New York when it comes to cocktails. Even more so when it comes to a weird but excellent hybrid of the two. The Dead Rabbit, New York’s toppest of cocktail bars is just that very thing, a pub-like ‘grog shop’ downstairs; an exclusive cocktail joint up above. It’s been named the world’s best bar countless times (and New York’s best by yours truly, Time Out), and now it’s making its way across the pond for a pop-up stint in London. The Dead Rabbit Grocery and Grog will be taking up residence at Bethnal Green’s Sun Tavern pub on Tue Oct 2, during London Cocktail Week. 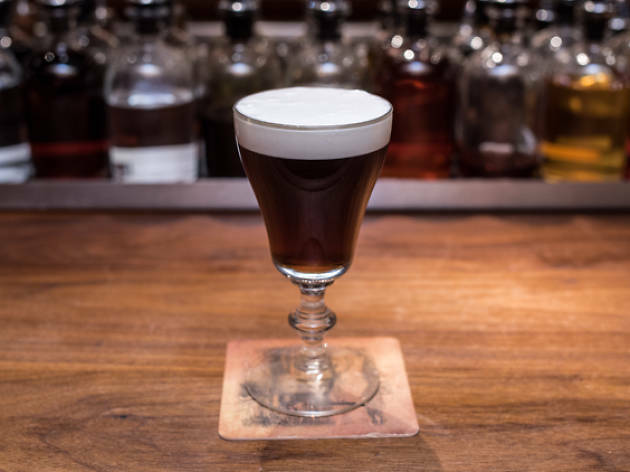 The takeover will kick off at 6pm and will see brand-new cocktails from the team being served up to thirsty punters, as well as the bar’s world-renowned Irish coffee being whipped up for fans from this side of the Atlantic. It’s the New York bar’s second time stopping by the pub, first taking over behind the stick during Cocktail Week celebrations in 2017. The bar also had a very fancy stint at Claridge’s hotel in 2017, where it brought the look and feel of the Financial District drinking spot to life inside Mayfair’s gorgeous hotel surrounds. Clearly, Londoners can’t get enough of their pub-meets-cocktail-bar stuff. The Dead Rabbit Grocery and Grog pops up at Sun Tavern, 441 Bethnal Green Rd, E2 0AN on Tuesday October 2. Find more great spots for tipples in London in our list of the ultimate cocktail bars.